The Funky Felter: I'm very proud to now be a part of 1000Markets! I'm very proud to now be a part of 1000Markets! 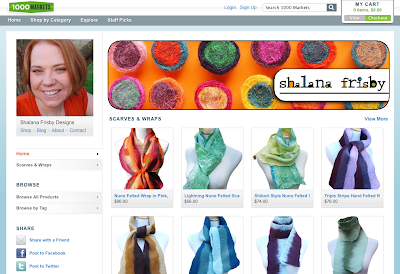 If you are an artist or crafter, you may have already heard of the online site 1000Markets. It is an extraordinary online sales venue for high quality, handcrafted items from art to jewelry to wearables to food, and so on. It is also a juried site with an amazing design layout that represents top quality artists. I am beyond thrilled to have been accepted there as one of their artisans! My new 1000Markets shop just opened today. It will house my couture lines of hand felted scarves, jewelry, and other wearable pieces. I have great expectations for 1000Markets and am extremely excited to be part of the site and the community there. Please visit my new shop often as I will be adding handcrafted products weekly. I have had a shop for awhile but have not paid much attention to it. I am planning on revamping and using it more. PS How is the baby?